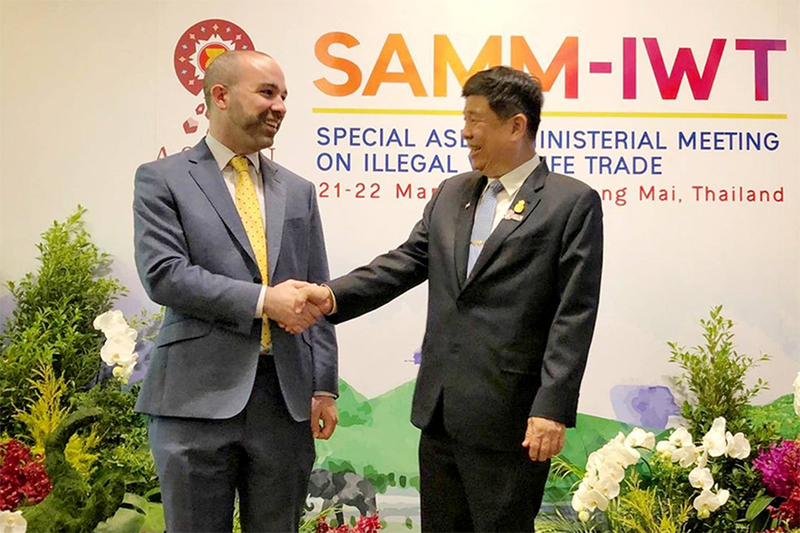 Mr Andrew Beirne, Economic & Prosperity Counsellor and UK Permanent Representative to UNESCAP, delivered a speech at the Special ASEAN ministerial meeting on illegal wildlife trade. Honourable Minister (of the Natural Resources and Environment) General Surasak, Ministers, your Excellencies, distinguished guests, ladies and gentlemen – good afternoon. It’s a great honour to be here today to address you on behalf of the United Kingdom. The UK is committed to deepening our partnership with ASEAN and with ASEAN members. I would like to thank Minister General Surasak Karnjanarat and the Thai Government for inviting us. And to thank the Thai Government for taking the bold decision to make countering the illegal wildlife trade a cornerstone if it’s ASEAN Chairmanship. Ministers, as you all know, the work of conservation and environmental protection is not about quick wins. It is work that will never be complete. The stuff of decades of hard work. In the UK, we have come to see countering the Illegal Wildlife Trade, like preventing climate change or marine plastics. An issue, in short, which will define the legacy that we leave for our children. That is why we chose to host the London Illegal Wildlife Trade conferences – first in 2014 and, again, last year in October. And it’s why our Prince William and a host of celebrities have since made tackling the illegal ivory trade a personal priority. I wanted to thank those of you who attended the conference. And to express the UK’s gratitude for its ongoing close relationships with you all on this issue. We commend you on the declaration which you have just issued. I am gratified to see the three themes of the London declaration reflected in your priorities around partnership, demand reduction and law enforcement. On partnership, we welcome your commitment to take continuous and concrete steps to strengthen collaboration across ASEAN. The transnational gangs at the heart of the illegal wildlife trade can only be tackled in this way. There are ASEAN mechanisms in place to promote cooperation already. But, as in Europe, there is always scope for more effective solutions. Bilateral agreements for information exchange and cooperation are a critical and simple way to ensure the better surveillance and integrity of borders. At the multinational level, the new ASEAN Working Group on CITES enforcement has the potential to act as a nexus for cooperation, but there may be other elements also. We hope, too, that ASEAN will make building deeper partnerships with international organisations and countries like a UK a foundation of its work to counter IWT. The UK is keen to continue building those partnerships with you all. Treating the illegal wildlife trade as a Serious Organised Crime also remains a priority. Globally the illegal wildlife trade is worth up to $23bn dollars annually. Translating this resolution into national law and policy can allow us all to better use information to dismantle and prosecute transnational criminal networks. Last year the UK funded independent experts who mapped out the path to doing this in countries around the world. We are happy to share these findings with you. A final theme of the conference was Closing Markets, and reducing demand for illegal wildlife products. The Ivory Alliance 2024, which launched at the London Conference, is a global alliance of leaders and public figures. The Alliance aims to reduce demand for ivory globally and so reduce the illegal killing of African elephants by two thirds by 2024. Ivory sales are, of course, just one element of demand reduction. As we prepare for the CITES Conference of Parties in Sri Lanka, there may be scope to do more – on ivory and other IWT products. Next week, the UK is hosting a demand-reduction workshop in Vietnam 25-26 March to discuss the options around this. In closing, I wanted to make the offer of UK collaboration and support as you collectively take this work forward. 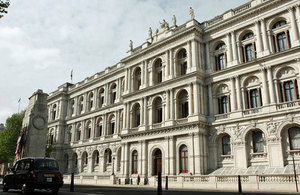 The UK is always looking to deepen it partnership with ASEAN and its members. Across ASEAN we already fund a wide range of activities from ranger training, to supporting intelligence-led customs seizures and developing high tech approaches to combat the challenges. We want to build and expand our existing partnerships across the region to counter IWT. I know my colleagues around the region are keen to continue discussions with you on these issues soon.